Shopping is a favourite pastime for many people; for others, though, it can be a real problem. Compulsive shopping is described as an uncontrollable urge to make repeated purchases. Although many individuals like to shop regularly, their shopping habits do not cause them a problem. Those with a shopping addiction, however, find it difficult to stop, often ending up suffering dire financial consequences because of their actions. The term shopaholic is often used to jokingly describe someone who shops a lot but, in reality, it describes a person who has no control over his or her impulse to shop despite it causing havoc to his or her finances and relationships. Many shopaholics will spend money that they cannot afford on items that they do not even need. It could even be that these individuals are addicted to buying a particular product. Many of these people will never even use the items they have purchased; they are simply buying to experience the ‘thrill’ of being able to do so. It is similar to a drug addict or alcoholic who experiences a ‘high’ from the substance to which they are addicted. While no shopping addicts can control the urge to shop, there are different kinds of shopaholic. 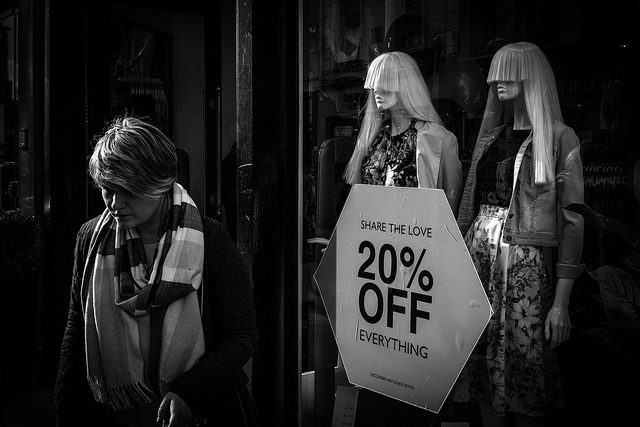 The compulsive shopaholic shops to relieve feelings of emotional distress while the bargain seeker spends money on items they do not need purely because these are on offer. Some shopping addicts are constantly spending on items to prove to others how well they are doing while others are caught in a cycle of repeatedly making purchases and then returning the items. It’s hard to tell if someone actually has an addiction or is simply a lover of shopping. Although many individuals spend too much money and time shopping, there is no suggestion that these people have an addiction. Those with an addiction will find it difficult to stop even when they are faced with a compelling reason to. Shopping addicts will often try to hide their addiction from loved ones. They may leave purchases in the car if their loved one is at home and wait until the house is empty before bringing them in. They may cut labels from clothing as soon as they get home and pretend that they have had the clothes for ages if questioned about them. Do you shop to make yourself feel better when you are depressed, sad, or angry? Do you often spend more than you can afford? Do you shop even though you have promised not to? Do you shop to lessen the guilt you feel about a previous spend? Are your relationships suffering because of your spending? Are you buying items on credit that you could not afford to with cash? Are you worried about mounting debts caused by your uncontrollable spending? Do you feel a rush of excitement after making purchases? Do you feel ashamed or guilty after a spending spree? If you have answered ‘yes’ to four or more of the above questions, you may be suffering from a shopping addiction that requires help. As with other addictions, a shopping addiction may be caused by the feel-good hormones released by the brain after making a purchase. Those who are addicted to drugs, alcohol, or gambling, for instance, will experience a sense of euphoria when they take drugs, drink, or gamble. It is the same for those who are addicted to shopping – after making a purchase they feel a sense of excitement and elation. Many become addicted to this feeling and want to recreate it repeatedly by continuing to make purchases or by spending more and more. Those with a shopping addiction may initially feel better when they are shopping and spending money. However, as the addiction progresses and the individual knows that they could be causing financial difficulty with their purchases, he or she may begin to feel guilty or ashamed after a spending spree. Guilty feelings may lead to anxiety, which can in turn result in more spending to relieve these feelings. One of the biggest consequences of a shopping addiction is financial hardship. Those who are compelled to shop often spend money that they cannot afford to spend. They may get into arrears with bills and build up debts through credit cards and loans. Some may even remortgage their home to give them money to spend, thus putting their house at risk. Relationships often break down when one partner cannot bring their spending under control. Many cannot understand why their spouse would put their future at risk for the sake of spending on things they do not need, and this can often lead to marriage collapse. Because it is necessary to make purchases in everyday life, it can be difficult to treat a shopping addiction. It is unlikely that someone could go the rest of his or her life without ever spending money or making a purchase. Nevertheless, this illness can be managed and those affected can learn to control spending impulses. Behavioural therapy and counselling are often used to treat those with a shopping addiction. Addicts must learn how to identify certain triggers and how to control their impulses. A shopping addiction is often the result of an underlying cause, so it is important that the addict works with a professional to identify this cause. Often, the reason for the addiction can be treated effectively with medication and support from medical professionals. It is important to seek treatment as soon as possible for a suspected shopping addiction before it becomes a major problem that destroys your entire way of life.